The legislative session is now underway. So, among our 5 Things in this issue, we feature one of the most consequential bills you may not have heard about: Rep. Jinkins’ legislation to create a long term care benefit for all Washingtonians. It’s a national trend setter, with states like California watching the progress closely. That, and some highlights from this month’s conference are teed up for you in this edition of 5 Things. The House Health & Wellness Committee last week heard public testimony on the Long-Term Care Trust Act, which would set up a public long-term care benefit in Washington State. If the bipartisan House bill (or its companion bill in the Senate) is signed into law, Washington workers would pay 0.58 percent of their wages into the trust program and eventually would be able to claim benefits, should they have difficulty completing the tasks of daily life. Long-term care—services 70 percent of people over age 65 will need at some point, according to this Milliman study—is not covered by Medicare unless the care is medically oriented; and the private insurance market for that sort of coverage is sparse and expensive. So, people frequently pay out of pocket until “they impoverish themselves to qualify for Medicaid.” Rep. Laurie Jinkins, who sponsored the House bill that would change that system, is feeling good about the bill, which received all positive testimony during its public hearing, and told us she expects it to pass out of committee this week. 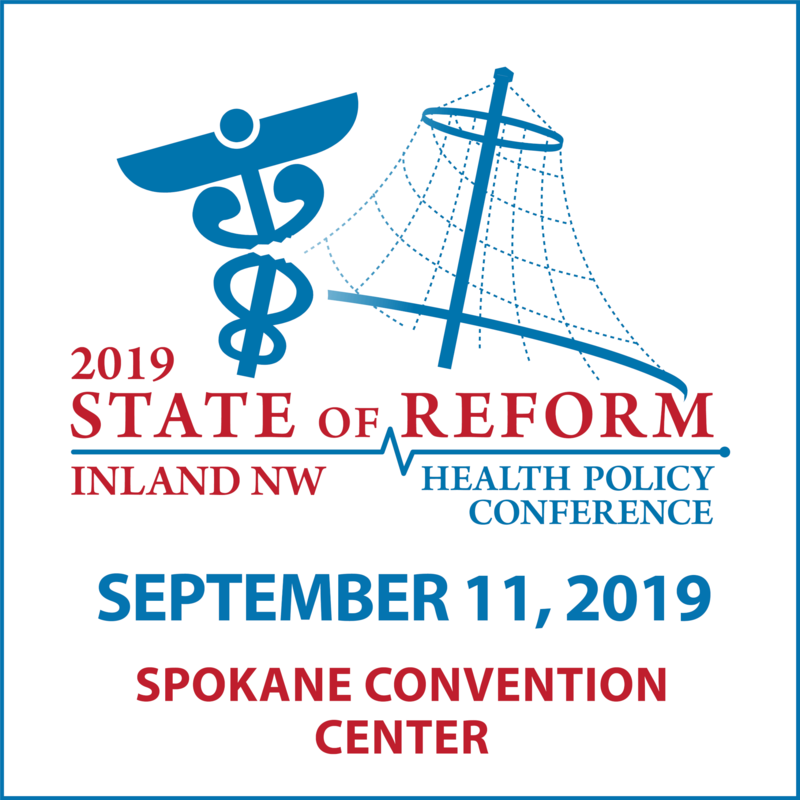 Earlier this month, we hosted our 2019 Washington State of Reform Health Policy Conference in Seattle, bringing together over 800 folks from across the silos of Washington State health care. If you weren’t able to make it to the conference, don’t worry, we’ve got you covered. You can take a look at this highlight video from the conference to get a feel for the sights, sounds, and energy from the event, and we recorded the keynotes which we feature throughout this edition of 5 Things. Kicking off the conference was our Morning Keynote with Colm O’Comartun. Colm is the former head of the Democratic Governors Association and is co-founder of 50-State, one of Washington DC’s leading consultancies on state health policy. In this conversation, Colm reviews the impacts of the 2018 midterms and highlights what this might mean for Democratic states like Washington in the future. Robin Gelburd is the President of FAIR Health, which has data on a few billion claims paid in the US. It is the nation’s largest repository of commercial and Medicare claims data. Consequently, Gelburd has a tremendous amount of comparative cost and utilization data at her fingertips. During her keynote with us, Gelburd highlighted some notable elements of the Washington State health care system that are unique. While nationally, ER claims paid since 2014 have doubled, they are down 31 percent here. 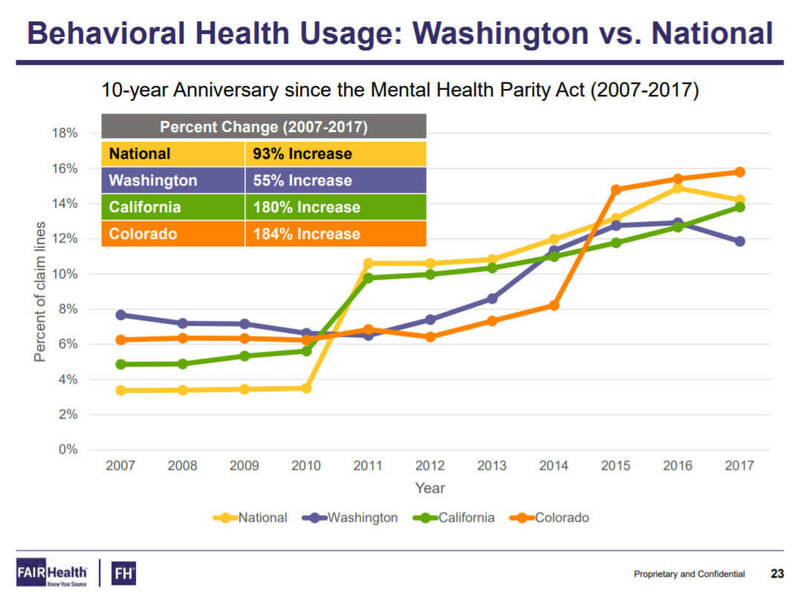 Claims for behavioral health lag in Washington since the Mental Health Parity Act, up 55 percent compared to 180 percent in California and 184 percent in Colorado. Nationally, BH claims are up 93 percent. You can see her full slide deck here. This year for our lunch keynote at the State of Reform conference, we interviewed five of the region’s most prominent senior market executives and health policy leaders. Joining us were Doug Bowes, President and CEO of United Health Care Community & State, and Susan Mullaney, President and CEO of Kaiser Permanente of Washington. Also joining me on stage were Washington State Attorney General Bob Ferguson, House Republican Leader J.T. Wilcox, and Representative Eileen Cody, Chair of the House Health Care & Wellness Committee. We got 10 tight minutes from each of them – no scripts and no slide decks. Consequently, it made for one of our best lunch keynote sessions since our first conference in 2011. The Washington State Health Care Authority’s latest value-based purchasing (VBP) surveyshows Washington outperforming its five-year VBP goals. Along the way to its goal of 90 percent of state-financed health care programs being in value-based payment arrangements by 2021, Washington continues to surpass its yearly VBP adoption benchmarks. The goal for 2016 was to have 20 percent VBP; actual VBP came in ahead at 30 percent. The most recent data shows that for 2017, actual VBP participation was 43 percent—13 points higher than the 2017 goal of 30 percent. The survey also includes information on top barriers and enablers to VBP adoption, as well as recommendations to continue the acceleration of VBP participation.